In 2018, TAP Adventures will be headed to Ireland and Scotland!!! The west coast of Ireland – where we’ll begin our adventure! scotland-ireland-itineraryThe TAP Adventures crew is very excited to announce our return to Ireland – the absolute favorite of most of the TAP teachers – and Scotland. We’ll be headed to Ireland, Northern Ireland, and Scotland in June 2018 to experience the history, language, art, music, environment, food, and people of the Emerald Isle and Bonnie Scotland!!! This will be our 12th student adventure, but the first time we are focusing on a country we’ve already visited. * In 2010, we spent 12 days touring Ireland, and the TAP teachers found the Irish people and way of life absolutely magical. We’ve been planning our return ever since. This time, though, we’re going to make it even better by crossing the Irish Sea and spending a few days in Scotland, too. In the past 10 years, over 400 students have traveled with us to places like Germany, Greece, Italy, Ireland, Spain, Japan, England, Poland, South Africa, France, and Peru! Now we’re adding one more adventure to that list. Check the FAQ, About TAP, TAP Trips, and TAP Teachers sections of this sight for more information about our program. 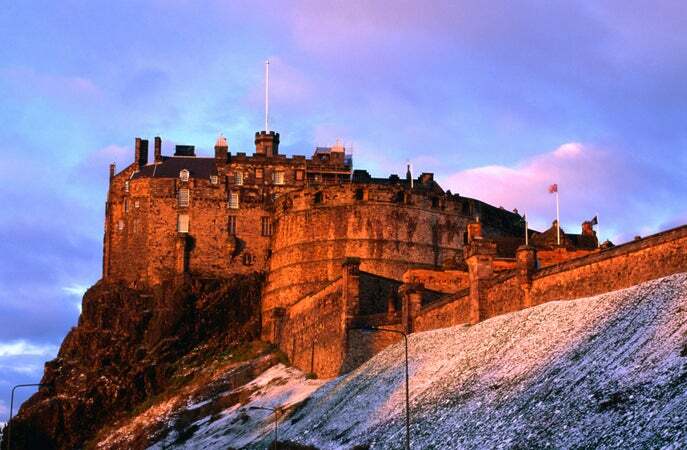 Edinburgh Castle – one of many castles we’ll visit this year! While in Ireland and Scotland, our students will participate in a once-in-a-lifetime adventure customized just for our group. The kids will get to explore the beautiful west coast of Ireland with a scenic drive around the Ring of Kerry, climb to the top of Blarney Castle and kiss the famous Blarney Stone, and visit the Rock of Cashel (the seat of Ireland’s mythological kings – kind of like Ireland’s Camelot). We’ll make our way slowly towards Dublin, where we’ll see Trinity College and the Book of Kells, ancient Viking ruins, and St. Patrick’s Cathedral. We’ll also get to participate in a special Gaelic Games excursion – learning about and participating in Gaelic football and hurling. After a few days in Dublin, we’ll make our way north to Belfast, to learn about Ireland’s struggles, some of its violent past and see the docks where The Titanic was built – before heading across the Irish Sea to Scotland. Once in Scotland, we’ll take a beautiful drive through the countryside towards Edinburgh – the site of the most awesome castle you’ll ever see. After a tour of Stirling Castle and the Braveheart battlefields, we’ll make our way through the Scottish Highlands to Loch Ness, where we’ll definitely have a monster hunt. All in all, we think with the culture, the history, the food, and the people of Scotland and Ireland – this may be our best adventure yet. While preparing for our adventures, students will learn about history and culture, help write our student guide book, become published authors, and have the chance to earn college credit. We want you to Join the Adventure!!! To apply to be a part of the trip, you must be a 7th-10th grade student in the Minooka/Plainfield/Oswego area. The application deadline is 11:59pm on October 15th, 2016. The application can be found here. Please read the application instructions carefully, because incomplete applications will not be accepted. The Scotland and Ireland itinerary can be viewed here. We hope to see applications from all of you soon, then we can begin getting ready for our incredible Irish/Scottish Adventure!!! We also have 3 spots remaining on our Peru trip (Peru itinerary). You may apply for the Peru trip in the same manner. *Yes, we have been to Germany three times – but the first trip in 2007 was 10 days, while the second time (2014) was just one day in Munich, and the third time (2016) was a mere seven minutes to walk across a bridge and say we we’d been in Germany. Also, if we’re being picky, we also went to England twice (2008 and 2013), but once was on accident.